Fall is perfet for comfort food and warm delicious chili while watching football (or reading while your signficant other does). I’ve perfected my chili over the few years and love making this recipe! We made it last weekend and it’s always a huge hit! 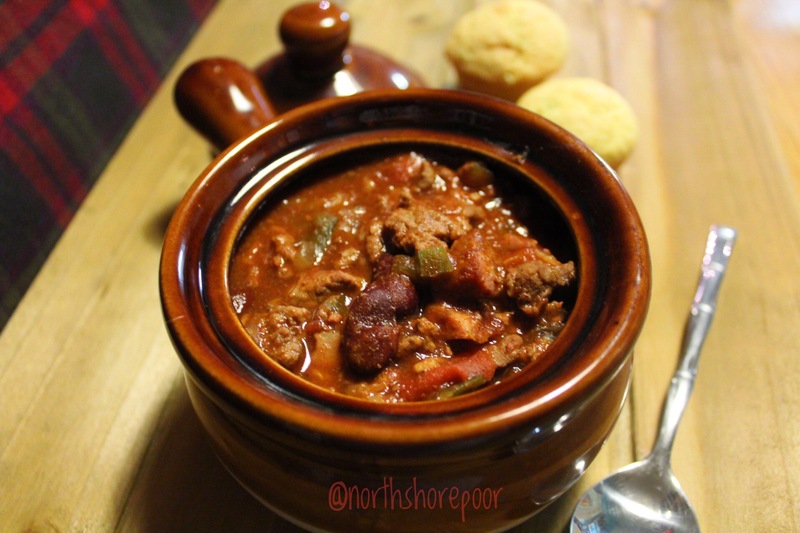 It is a rich, flavorful, sweet and spicy chili that makes you feel like you’re in a cozy log cabin on a cool fall night. The cinnamon and cocoa add a rich and unique flavor. Try it out and let me know what you think! To make this PALEO simply omit the kidney beans and brown sugar. You can sub the brown sugar with coconut sugar to get the sweetness. Season ground beef with salt, pepper to taste and cook in pan until browned. Add to crockpot. Sautee bacon in pan and cook until crisp. Taste test for maximum enjoyment. Add to crockpot. Enjoy with corn muffins on the side! 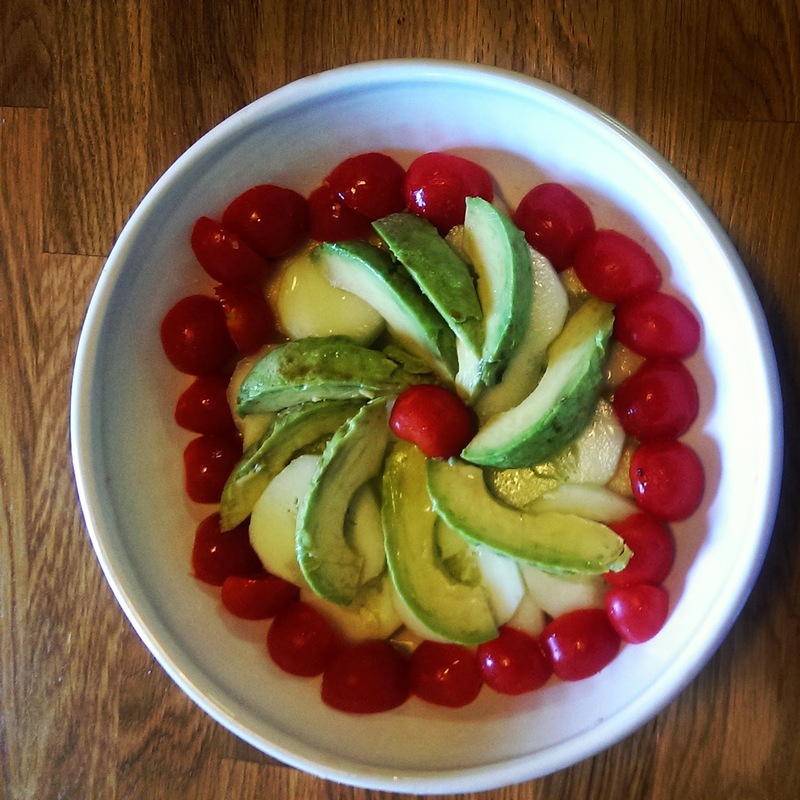 You can garnish with shredded cheese, sour cream, or my personal favorite, avocado! This is where I cheat and simply use JIFFY corn Muffin mix. Follow direction on box but use KerryGold Garlic Herb butter. Add another tbsp or so for a richer flavor. What do you add to your chili to make it your favorite? In honor of #tacotuesday I am going to share my recipe for arrachera which is Mexican marinated skirt steak. It’s something Joey and I love to grill and share with friends. 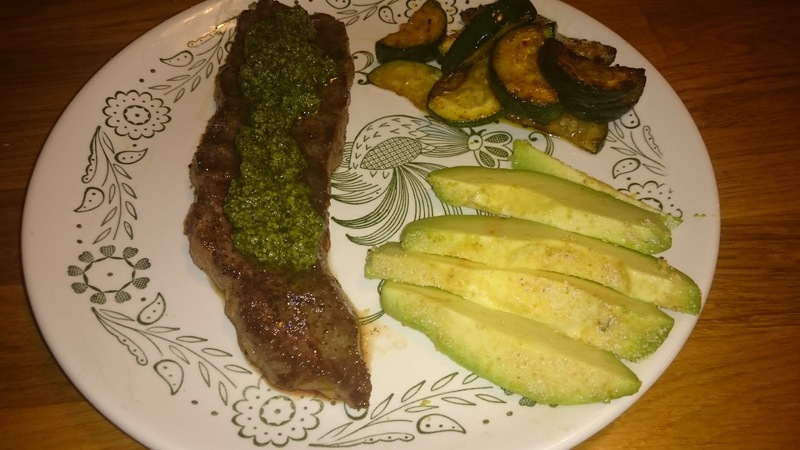 We perfected the marinade this summer and I am happy to share with you! I personally like to clear my kitchen island/counter entirely, lay out my spices and open them, and line my work space with clear plastic wrap. Cook for another 5-7 for medium results. 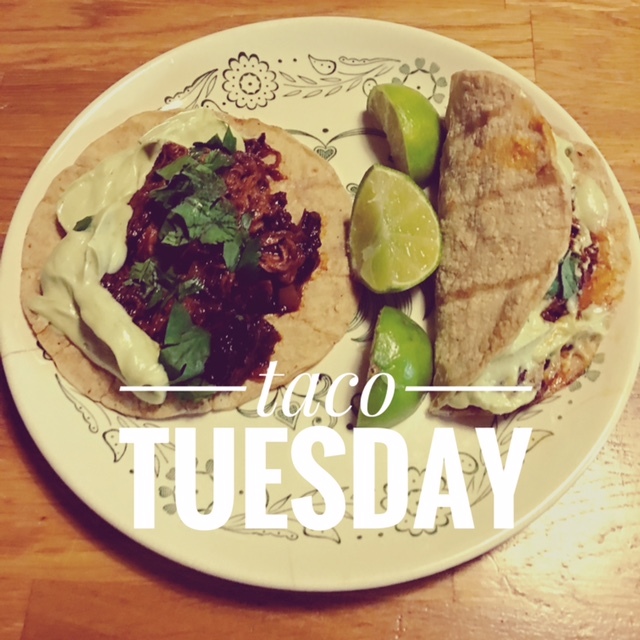 Make your tacos and enjoy! 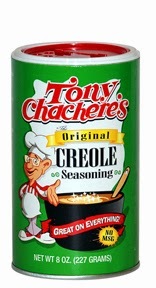 Tip: You can make an Avocado Cream sauce by throwing 1/2 cup plain Greek Yogurt with 1 large Avocado,and some Tony Chachere’s creole spice and lime juice to taste. Pulse and enjoy over tacos! Who doesn’t love pesto? 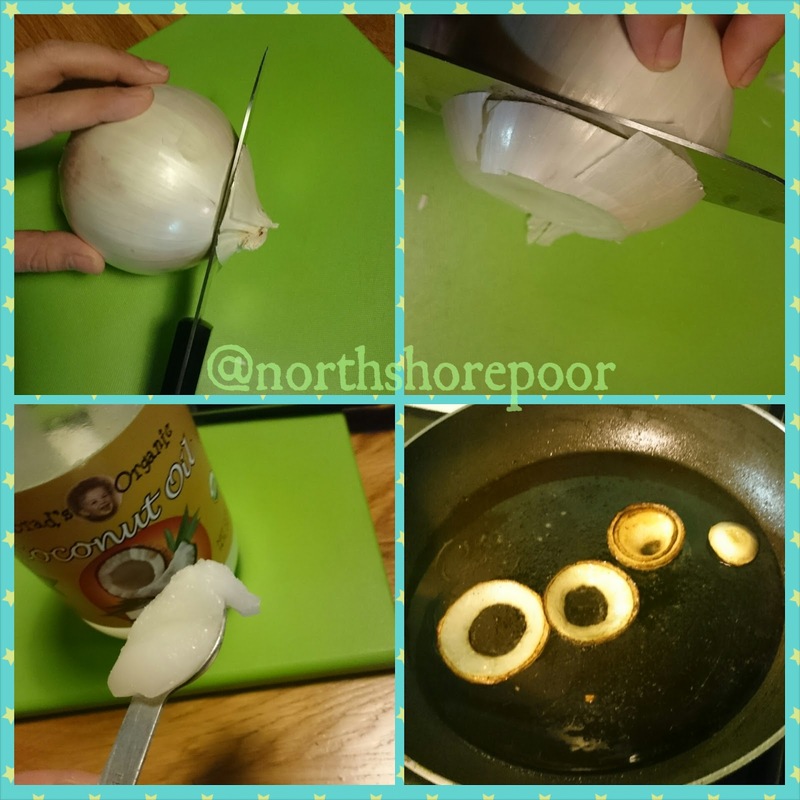 It’s delicious and adds a great taste to any dish. 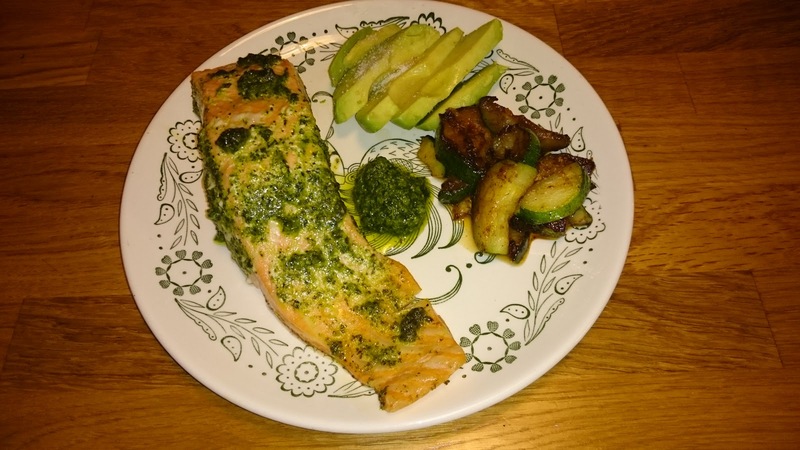 Tonight I made a delicious and easy pesto salmon with creole seasoned zucchini with avocado. It’s actually the second time I’ve made it this week because it’s so simple and healthy. A huge bonus to making anything at home is that you know what’s in it. 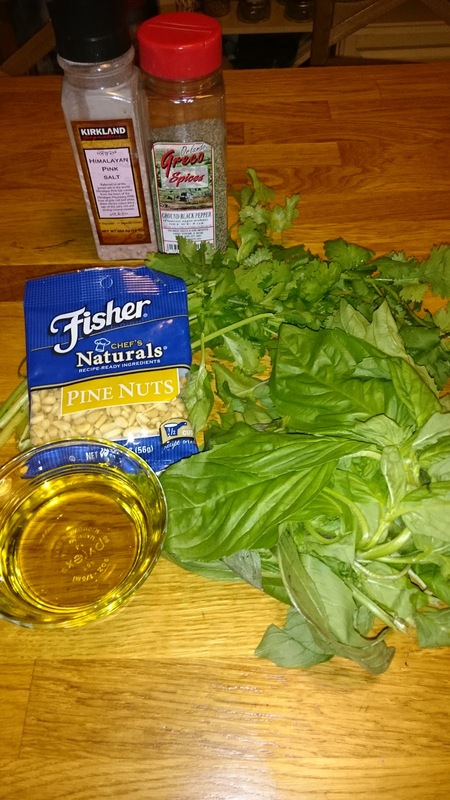 Making pesto is so ridiculously easy I can’t believe I didn’t start years ago. I will honestly never buy pesto again because I like mine better and you can freeze the leftovers if you don’t think you’re going to use it within the next two weeks. I’ve actually seen some pinterest boards that have people making it in ice cubes and freezing it for portioned sizes. Never tried that but could be interesting. 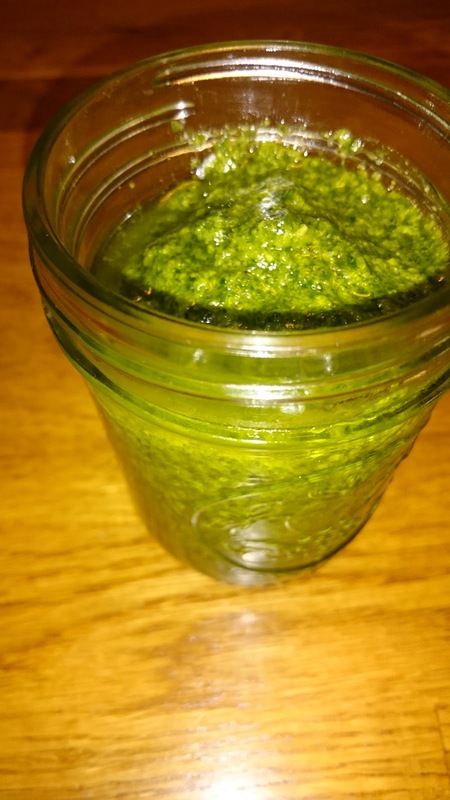 Anywho, here’s my recipe for a paleo cilantro-basil pesto. 1. Put garlic cloves in the food processor (if you have one) and pulse until chopped. If not, mince by hand and add to food processor. If you don’t have a ninja or something like it, feel free to use a blender. 2. 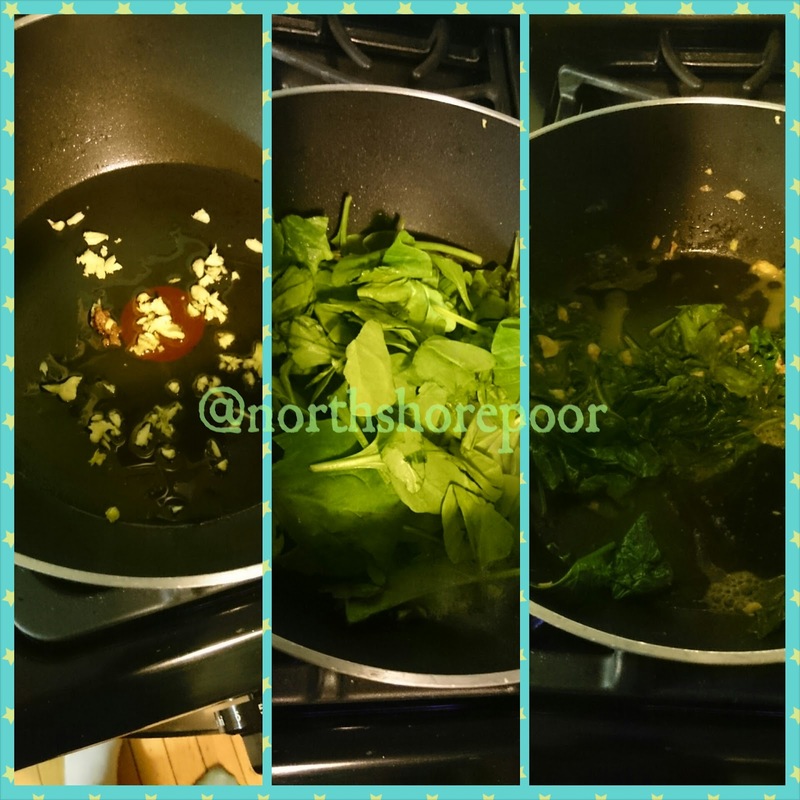 Add in basil and cilantro leaves, I like to take the big stems off but you don’t have to. 3. 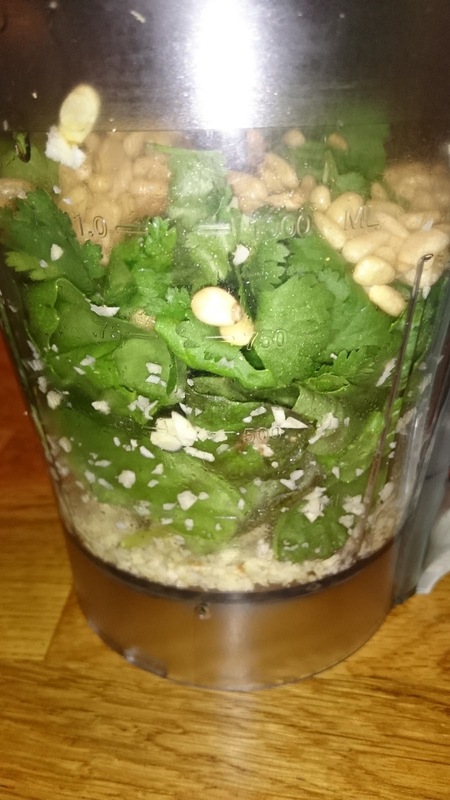 Add in pine nuts. 5. Add in olive oil until you get your desired consistency. 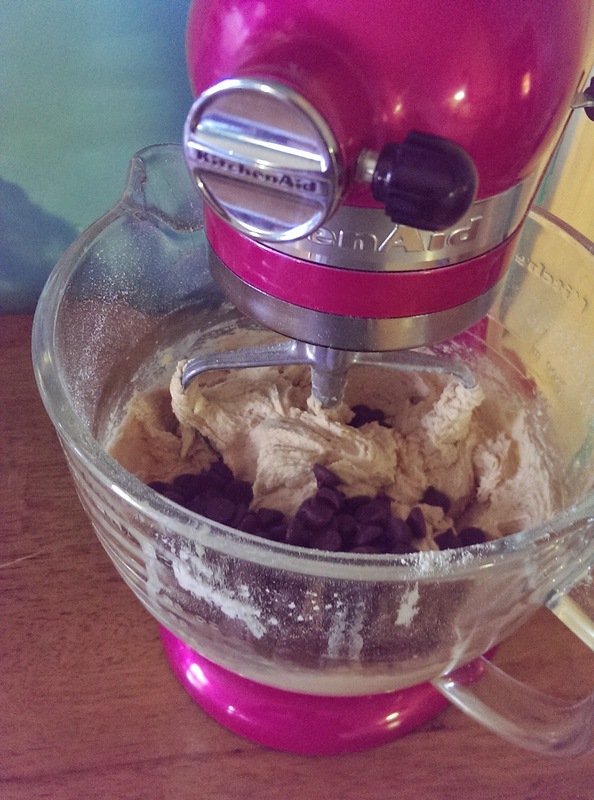 You can easily modify this recipe in a few ways. 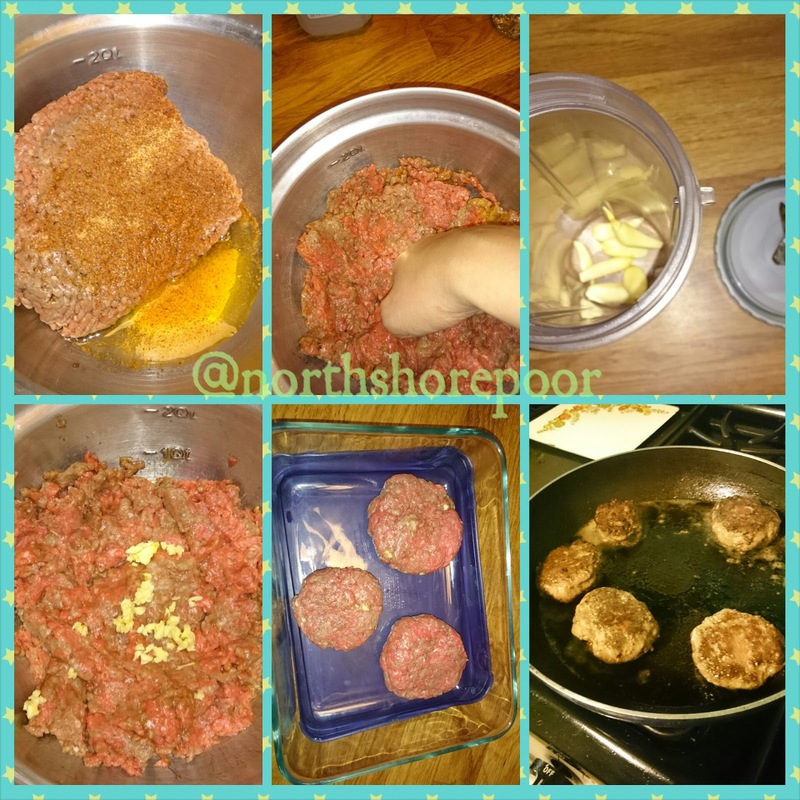 So I’ve instagrammed about my favorite burger to make at home and wanted to share the recipe with everyone who asks me about it! To the left is more of a lunch version, with an avocado and tomato salad underneath. This is a really versatile burger and easily customizable! You can always top with a fried egg, peppers, or even bacon! 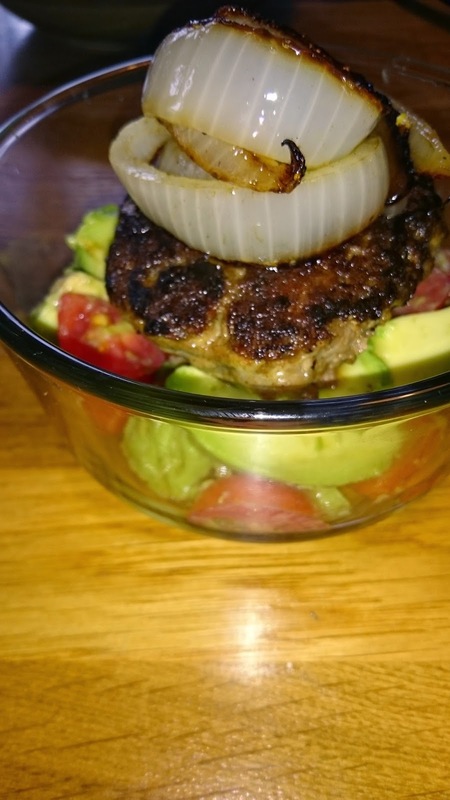 You can make the burgers ahead of time with a weekly meal prep and then just oven warm up for a few minutes while you cook your sides. 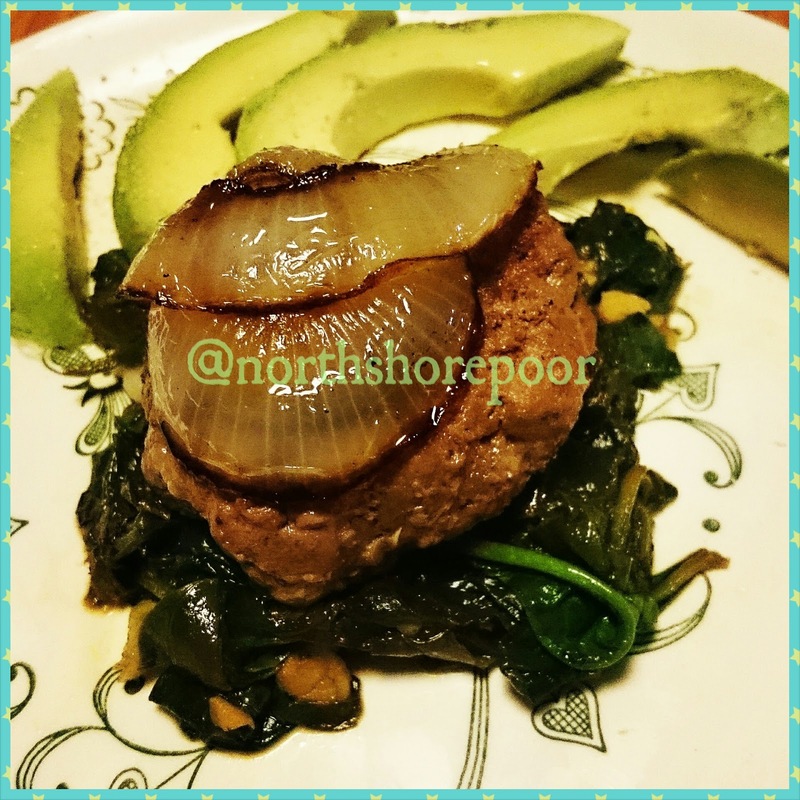 Eating paleo is something that is so easy and tasty and this burger is a great example. No sauce or cheese needed, there is so much flavor on it’s own. When you have good meat and seasonings, you have all the flavor you could want and don’t need to disguise anything! Add a few more shakes of seasoning if you think there’s not enough, I usually do a shake or two more since I figure, why not? 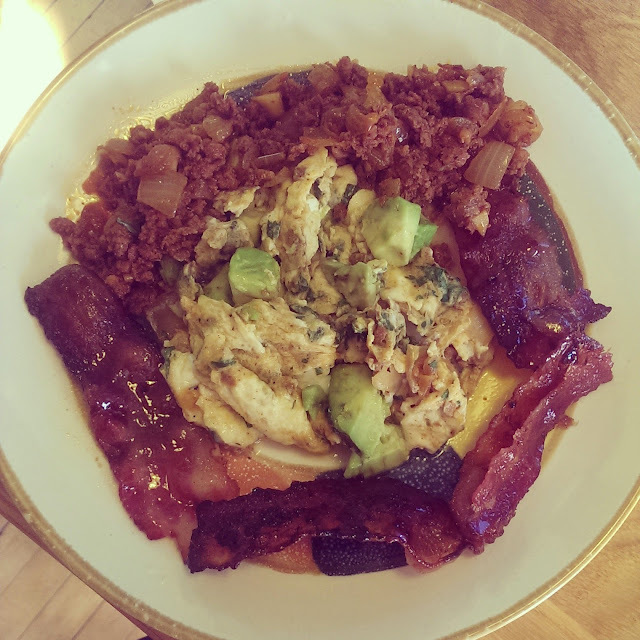 Avocado and Bacon and Chorizo, oh my! I don’t always want to leave the house on a Saturday morning to spend $40 at Walker Bro’s or some other North Shore breakfast hotspot (see: Sarki’s, Kauffmans, etc). I also try to follow the Paleo lifestyle (no grains, dairy, or artificial sugar) and try to eat pretty healthy. So when it’s Saturday morning and I don’t want to get dressed or spend money, I look at what’s in the fridge and JoeyWaffles and I start making things up. Start with the chorizo first. 17. Crack another egg and separate yolk. 18. Throw yolk out unless you want, I just try to only use one. 19. Put egg white in bowl. 22. If bacon looks halfway done or you just want to do it now, open the maple syrup and drizzle it on the strips, to your liking, I like a lot so on it goes! 23. Turn on a fan/or keep the heat low so as not to smoke out the place. 23.5 Joey never makes the house smoke, I tend to so…it’s probably me. Keep the heat lower then high. Medium-ish works. Voila! You have a delicious scramble with a good meat to protein ratio. This is easier then it seems and really fun to modify. You can leave out the chorizo or leave out the bacon, you can use regular bacon without the maple, etc. You can add roasted red peppers, onions, or whatever you want to the eggs. Take whatever you have in your fridge and make your own version and enjoy! So tell me, what do you like in your scrambles? What are your favorite Saturday morning meals?